Teaching abroad has been on my radar for the longest time. I would avidly read books set in exotic locations, dream about meeting eccentric locals and living somewhere that is entirely new to what I have grown accustomed to. Now, at twenty-four years old and having just completed my training to be a Primary School teacher in the UK, it occurred to me that this was my moment. Uncertain of where I wanted to go but keen for an adventure I packed up my bags and moved to Mexico to complete my TEFL qualification. I had the most incredible six weeks there but as much as I loved Mexico I found myself applying for jobs in Spain. 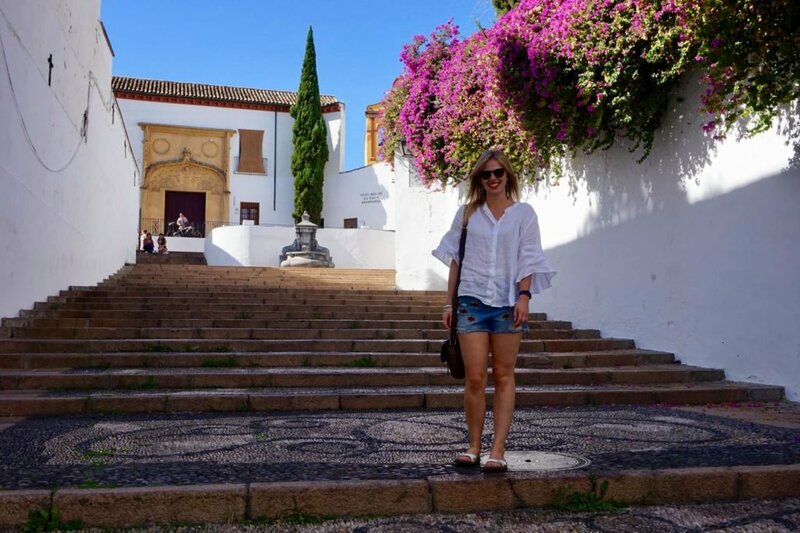 There is something about Spain, in particular Andalusia, which connects with me and when I found out I’d been offered a job there- I was thrilled! Now, only four months after I packed up my life for Mexico, I’m now a Spanish resident. I live in a stunning Roman city called Cordoba that was once the heart of Islamic Spain. It’s a fascinating city with mesmerising architecture, cobble stoned streets, lush flowers, rich culture and endless secrets for me to discover. I still have so much to learn and my adventure is only just beginning but here are five things that learned living and working in Spain so far. The first day I arrived in Cordoba I wandered through the narrow streets, trying to find my AirBnB and wondering where on earth all the people were. Finally, I found the apartment and rang the buzzer only to be greeted by a furious Spanish lady. You see, I was an hour late arriving and, in doing so, had broken rule number one of Spanish etiquette. You do not, I repeat, do not interrupt a Spaniard during their Siesta. As a Brit I am used to a fixed daily routine. For my entire life, I have woken up somewhere between 7 and 10 to have breakfast, lunch at 1, and dinner at around 7pm before bed at around 11. However, as I learned on my first few days, if you do that here you will not meet any people. In fact, most restaurants don’t even serve food until 8pm. This is because the people of Andalusia are, essentially, nocturnal. This has been the most difficult thing to adjust to but now I sleep, lounge around and do basically nothing until 3pm when my day begins. Finishing work at 10pm may seem late, however, this is when the streets come alive. Every day the locals get dressed up and promenade around the beautiful cobbled streets. Suddenly, a seemingly ordinary road is filled with tables and chairs and bursting with people laughing, chatting, gesturing, eating tapas and enjoying life. The weekends are even more extreme and your Friday night plans are unlikely to have even been made by 11:30pm. In fact, you can be expected to be queuing for entry at a nightclub as late as 3am. As a dance enthusiast, I was excited to experience some Flamenco first hand. I expected the beautiful dresses, delicate twists of the hands, intricate finger picking of the guitarist and the enthusiastic calls of “Ole” from the audience. What I didn’t expect was the raw passion that is Flamenco. I know now why you are unlikely to see Flamenco classes offered and the truth is because it seems that the real Flamenco can’t be taught but is something that runs in the blood of these incredible dancers. They don’t care about the rose in their hair or the pleasure of the audience but they care about the emotion and as soon as their feet start the rhythmic tapping you see their faces relive grief, pain, love, regret and anger. They are completely lost to the emotion and suddenly the only people in the room are the dancer, the guitarist and the singer. It’s as if they have an issue to resolve but instead of discussing it with words they are responding to each other’s rhythms. They are lost to the magic of the moment and so too are their audience. The locals here too have the Flamenco rhythms permanently vibrating through them. At a local restaurant, a guitarist will play and soon you will hear people rhythmically clapping along and muttering their approval. This clapping is, itself, a musical instrument. If you listen closely enough you will likely hear a rhythmic clapping sound echoing around the narrow streets. This spontaneous gesture is common and seems to represent a shared understanding, passion or even language that is so intriguing. It seems to fit with the spontaneous nature of the Andalusian people. Moving to a new country is possibly the most exciting thing you will ever do. The unknown city holds endless possibilities and the incredible feeling of everything being in ahead you. At the same time, however, you realise that your safety blanket of your close friends and family has been ripped out from beneath you and, basically, you’re on your own. The first few days or weeks before I started my job were scary. I explored the city and discovered exciting things but I was hyper aware that I was on my own and had no one to share them with. I found myself wondering about the decision I had made and wishing I was back home with my friends, family and my cat. It was unsettling at the time but I’m mentioning this now because, having spoken to other teachers, I know that this period of doubt is so common and a phase that everyone goes through. Fear not, however, as the wonderful thing about being an English teacher is that more than likely you will be working in a school or language academy where there is an instant friendship group waiting for you. This support group is incredible and you’ll likely find a Facebook group or equivalent lurking with numerous offers for socials and other opportunities to meet people. Just be patient; it will all fall into place. Before you know it, you will find yourself with friends and you will begin to feel comfortable and at home. What is tricky, however, is that this network makes it quite easy to live abroad without learning the language or making friends with locals. My advice to you is to abandon your British uncertainty or any other hesitation that you may have and be bold! Take up a new hobby, attend local events, be brave and speak to the locals. Odds are that people will be warm and welcoming and if you are bold enough to take the first step then soon you will learn the language, make friends and have wonderful new experiences. Being brave really paid off for me and, despite being naturally a little shy, I have learned that it’s always worth stepping out of your comfort zone. Back in England I loved to Salsa dance but when I arrived in Spain I was too scared to go dancing on my own. I didn’t know if I’d be able to find classes and, even if I did, I thought that the people there would see me as an outsider and wouldn’t welcome me in. I really wanted to go to a class but I was irrationally afraid of turning up on my own. One evening, however, I decided to be brave and turned up to a class having memorised some useful Spanish phrases that might be needed if anyone tried to talk to me. I’m so, so glad that I was bold and gave it a go because now I’m back doing a hobby that I love, learning the language and meeting new people. Everyone in that class was warm and welcoming and, months later, despite not really being much further on with my Spanish, I’m greeted with big smiles and cheek kisses. So, if you want something then just be brave- you never know unless you go and, when you think about it, what have you really got to lose? iving in Cordoba (and having an Iphone with zero battery life) has taught me the joys of turning of the GPS and just getting lost. The streets of Cordoba were designed so you lose your way in. Many of the streets lead to a dead-end which, historically, were to confuse any potential invaders with only the locals knowing their whereabouts. There is a maze of narrow, cobbled alley ways and, with every twist and turn, there is something new to discover. There are ancient doors with metal knockers that are so unusual you can’t help but wonder about all the people who have passed through them throughout the centuries. The real secrets, however, lie behind these doors. Cordoba is famous for its patios; secret court yard hidden behind the walls. A tranquil square with roman arches painted in Moorish colours, stunning water features and white walls adorned with blue flower pots. Even approaching November, the streets are filled with flowers adding to the vibrancy of the streets. Wandering on you hear the sound of laughter echoing as you stumble upon hidden squares where the locals enjoy coffee with their friends. I don’t think I’ll ever get bored of just wandering around this city. Arriving here it would be so easy to just follow the guide book and see the tourist sites. However, the real Cordoba can be found as soon as you stop looking. So, turn off your phone; shut the guide book and see what you will discover. Each morning I wake up and, for a split second, wonder where I am. When I realise, however, that I’m living in Spain I feel this rush of excitement. I know there will be difficult days, days where things won’t quite go to plan or days where things are generally a struggle. Being in a different country doesn’t eliminate the trials and tribulations that come naturally with life, however, that sense of possibility that comes with every day is incredible. I’m so, so happy to be living my dream and incredible grateful that I was brave enough to take that leap. I can’t wait to see what this year (or potentially even longer…) brings!